Chicago Scouts Association to present the award on January 12th, 2017 at Sam & Harry’s in Schaumburg, IL. The Chicago Scouts Association is pleased to announce Chris Singleton as the 2017 recipient of the Charlie Donovan Memorial “Passion for the Game” Award. The award, which is sponsored by the Chicago Scouts Association, is given to an individual who has exhibited passion for their craft within the game or business of baseball. 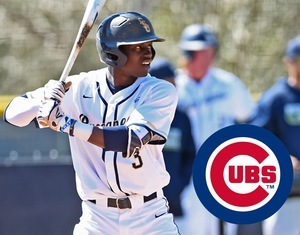 Chris, drafted in the 19th round in June out of Charleston Southern University, just completed his rookie minor-league season in the Chicago Cubs organization. “In baseball some players are labeled game changers, but Chris Singleton is a life changer! I was so fortunate to have been able to coach Chris and to have a front row seat to his development as a baseball player and person. Chris has a passion as strong for people in need as he does the game of baseball. I cannot imagine anyone who personifies the Charlie Donovan Memorial Award more than Chris Singleton!”, said Assistant Baseball Coach for the University of South Carolina, Stuart Lake. Two years ago, Chris experienced a nightmare. His mother, Sharonda Coleman-Singleton was one of the victims of the Charleston, South Carolina church shooting on June 17, 2015. His response, on a baseball field, just one day after losing his mother, and his message of “love is stronger than hate” was nothing short of amazing. "If we just love the way my mom would,” Singleton said then, “the hate won’t be anywhere close to what love is.” It’s that strength for humanity that makes Chris the perfect recipient. The award is a custom design and the creation of Trophyology, designer of handcrafted custom, heirloom-quality awards and trophies. The mission of the Chicago Scouts Association is to perpulate the sport of baseball within the Chicago land area, to enhance the community spirit and to provide for the well-being of our youth through positive and supportive endeavors.